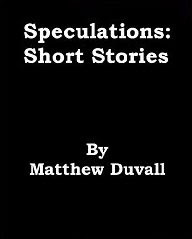 Matt Duvall has a new book--Speculations: Short Stories. This book collects eight stories and one novelette of speculative fiction, originally published in magazines such as Chizine, Horror Garage, The Ultimate Unknown, Eye Contact and more. What would happen if your shorts grew eyes? What could be creepy about Christmas? And why shouldn't you rent your spare room to a stranger? These questions, and more, are answered inside.